Executive Producer of the Alexa Conference Bradley Metrock speaks to guests during the Alexa Conference Tuesday, January 15, 2019 at the Chattanooga Convention Center in Chattanooga, Tennessee. The event was presented by VoiceFirst.FM. "Alexa, how many people registered for the Alexa Conference in Chattanooga?" That's double the number that registered for the conference in 2018 and includes attendees representing a dozen countries, according to the conference's organizers. 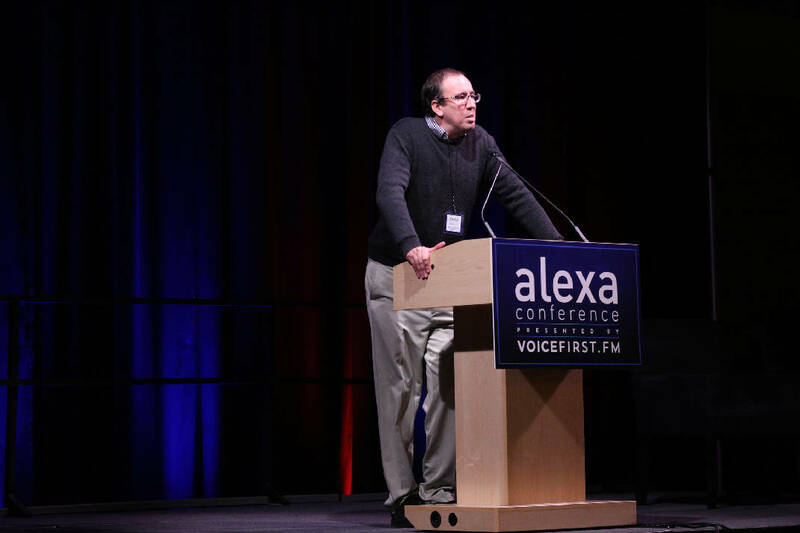 The third annual Alexa Conference kicked off at the Chattanooga Convention Center Tuesday and will continue through Thursday afternoon with exhibits and speakers offering the latest news on voice technology. While the conference is full of so-called "geek speak" and tech terms that might cause the average person's head to spin, some of the takeaways from the conference, organized by VoiceFirst.FM, were that voice-enabled devices could have a transformative impact today and in the future, especially in the health care industry. The EPB-sponsored event is showcasing what many officials promote about Chattanooga — its 9,000-mile fiber network and advanced smart grid in a 600-mile service area. Bradley Metrock, executive producer of the conference and host of the podcast, "This Week in Voice" by VoiceFirst.FM, is a Nashville resident and Birmingham, Alabama, native who thought Chattanooga would be a natural fit for the conference. "We wanted to marry an emerging technology with an emerging city," Metrock said Tuesday. Mayor Andy Berke spoke to attendees at a luncheon Tuesday afternoon, recalling Chattanooga's history as "the dirtiest city in America" with a dying downtown that reinvented itself so it could be at the "forefront" of new industries. "We knew voice was a big piece of the future, and Chattanooga will not be a city that holds onto its past," he said. Berke added, "This city of creators is always looking out for the next big thing." With Amazon introducing its Alexa-enabled devices and Google Home assistants entering the market, it could be argued that voice technology is already a very big thing. Echo and Google Assistant devices can provide news, music, weather updates, change TV channels, adjust thermostats, call 911 in cases of emergency and more. Attendees used a variety of words to describe how they feel about the future of voice technology: exciting, confusing, practical, inevitable and more. One of the big focuses of the conference over the next few days is its role in helping elderly citizens. Stuart Patterson, CEO of LifePod, talked about the promise of proactive voice services to help care for seniors. LifePod uses voice technology to assist the elderly, from reminding them when to take their pills to turning on their favorite music without having to be prompted. The difference between LifePod and and other voice-enabled devices is that it doesn't require the user to "wake up" the device by saying a name or certain word, like "Alexa." Proactive devices can be set up to speak to the user at certain times throughout the day. In a breakout session about voice technology and its potential among the world's aging population, only two of the 50 participants were Chattanooga residents. One of them was Garry Mac, spokesman for Hospice of Chattanooga. A conference official said 30 percent of the attendees were local. Mac said he was interested in attending the conference because 95 percent of hospice patients are in their own homes. "For any of us in home health care, there is no doubt this is the future," he said. "The adoption of voice technology by older citizens is increasing rapidly." But while Mac was there on business, he couldn't help but think about his 92-year-old mother and everything she could do with the Amazon Echo device he bought her recently. "Being able to use Alexa will improve her life greatly," he said. Speakers also touched on the security concerns some have with voice-enabled devices and the fears that they are always listening. They discussed how the devices can lesson social isolation and loneliness among elderly people and how voice technology can lessen the barriers blind people have with smartphones and keyboards. They also talked about the research going into helping the segment of the population who can't hear or have difficulty with speech so they can also enjoy the benefits of voice technology. For those interested in learning more about voice technology and the future of it, there's a special discount and $20 registration fee for the local community on Thursday from 8 a.m. to noon. To learn more or to register, visit voicefirst.fm/alexaconference.